The last run of the fall started a bit ominously. While picking up Lois at Breakheart and moving Gatorade from my car to hers I heard a hissing sound. Following the noise led to her rear right tire where a nail had embedded itself through the tire treads. It wasn’t flat yet but it would be sometime soon. A problem to tackle later in the day. Arriving at Brueggers around 8AM there was some quick decision making on clothing for the day. Short-sleeve? Long-Sleeve? It was in the 50s but overcast and sprinkling. I opted for the short-sleeve, so on the sidewalk I took off my windpants and my longsleeve shirt and suddenly realized I was half-naked in front of the window. Inside a group of nine women hardly took notice, perhaps I need to try that Axe chocolate body spray to get attention. With the clothing choices made we headed out the door. Brian and I took the lead for a short time until Judi wooshed by through the wet leaves. With a pat of the Clarence Demar monument we were off up Main St towards Wakefield. Through sticks, pine cones, pine needles and leaves left behind be a windy over-night rain storm we made our way to the first water stop at Sue’s car at the corner of Nahant and Main St. Before heading out on our next stretch a few tactical decisions were made. I left behind my glasses which were covered in misty rain droplets and fogging up. Also Sue, Joanne and Lois discussed the snack situation at the next stop… which was limited. It was decided that some Snickers needed to be transported ahead and reluctantly I volunteered to be the Pony Express (sans Pony) to deliver them. While our recovered BAA Half marathoners turned back to finish 6 miles for the day, off I went down Nahant St, Judi and Brian well ahead of me at this point, Beth and Audrey right behind me. Crossing Farm St the route took us up past several football games and practices, Pop-Warner, Middle School and High School teams occupying every field as I carried a baggy of candy in the nook of my arm like a wide-reciever making his way to the endzone down an open field. Up past the Voc and through the slippery leaf-covered hills of Breakheart to the Saugus side of Breakheart we went. Getting to the water stop I found Liz waiting next to Lois’ locked car. She unlocked it before we left, I saw her do it, but it had locked itself. It’s like those Chevy commercials where the gas pumps hate fuel efficient cars and lock the doors and let air out of the tires when you’re not looking! With some water from Liz and some candy from my bag we improvised an impromptu water stop and headed on our way once more. Through the flatter side of Breakheart Beth, Audrey and I chitchatted our way back to the Wakefield side. Audrey was very pleased with the downhill heading back to Farm St after the challenging hills of Breakheart. As we headed past Wakefield High the marching band was assembled in the parking lot but remained silent as we went by. Lois, Liz, Nancy, Sue, and Joanne were treated to the tune of Thriller as they went by, I’m sure bringing thoughts of Katie Sinnott to mind. Although I missed the band I was treated to random song lyrics from Audrey as we traversed Nahant St back to the final water stop. A quick drink and Snickers all around, our little pack headed out for the final three miles… leaving my glasses in Sue’s car by mistake. D’oh! Beth and Audrey kept up a good pace all the way down Main St while I tried to distract from thinking about slowing down with many of my not-very-interesting stories. A great 12 miles for the two of them, looking ready for the Seacoast Half in two weeks. Behind us Lois and Sue came flying in, having run a strong 12 miles plus an extra hill as they turned off to the left onto Green St in Wakefield to spice up the last three miles of the run. In short time all the runners (and my three kids) were back at Brueggers enjoying coffee, bagels, chocolate covered pretzels from Joanne, and Starburst jelly beans from Kelly who ran 3 miles for her return to running after her maiden voyage in the world of marathoning last week. And all that’s left for the Fall training session is the running of the last marathons and half marathons over the next few weeks… and changing Lois’ tire for her. This week will be the final long run of the Fall training session and with that we’ll try to rap a few things up. First, congratulations to all that ran Baystate. We had a mix of goals going into that race, some looking to qualify for Boston, some hoping to just complete their first marathon, and others just putting another notch on their marathon belt. Amazingly I think everyone was successful in doing what they planned to. Great to see! Second, thanks to all that contributed to my very nice and very generous gift. Its been a pleasure to work with all of you to put together a very successful long run programs. Seeing our speedy runners excel at races around the globe, our veterans push themselves through the familiar grind of training in hopes of reaching new goals, and (my favorite part)Â theÂ rookies heading into places they’ve never been before with wide eyes and great hopes. Seeing all that and knowing I had a little to do with everyone’s experience is thanks enough for the times I pick up the water, Gatorade and Gu and figure out which hill to make you climb each week. And now for the So Long… this is the last long run of the season. One final 12 mile run, most likely out Main St and cutting over to Breakheart for one last jaunt through some big hills. I’ll post a map tomorrow and will need help for two water stops. I don’t have any water stop supplies. I think Lois has one bin and Sue has two? We can discuss how we want to do this after I know who plans on coming. As our long run friends were shivering up in Lowell, anticipating the start of their fall marathon or half marathon, we were on our way out of Breuggers for a 14 mile round trip run to Horn Pond in Woburn. Nine of us had met at Brueggers, although only eight headed out the front door. Julie ducked out the back door, into her car, and back home to change from shorts to pants. Despite the temps being around 40 degrees this was the first week of the season where wind chills became a factor. With a gusty wind blowing it felt closer to 30 degrees. We started down Main St to West Wyoming. We stayed in a tight little pack until I couldn’t take the cold wind any longer and sprinted ahead to raise my body temperature. As I approached Grimsby’s Julie joined in sporting some running tights. Brian caught up to us and the three of us led the way up to Spot Pond. From Grimsby’s to Spot Pond was pretty quiet as we climbed the hill but earlier in the morning there was a lot of activity there. On my way to pick up Jo-Ann from the Horn Pond water stop there was an accident there, two cars heading in opposite directions side-swiped each other. One car’s front tire was blown out and the fender was hanging off. The SUV heading up the hill had quite a bit of damage to the left front fender. In the same area, as Nancy and Sue rode back from setting up water stop 1 they saw a deer where the Fells trail crosses Pond St, we assume to check out the accident. At the top of the hill several cars were pulled over and a truck with flashing lights had pulled up behind them. Very active area prior to 8AM but all was cleared as we went through, up by the pond and the zoo where the wolves were on the prowl, and over to water stop 1 on the corner of Forest St and Eugene St in Winchester. We huddled in back of Sue’s SUV, shielding ourselves from the wind, drinking gatorade and eating Snickers bars until the whole crew was ready to continue on. Down Forest St Kaj, Brian and I took the lead again. Through piles of autumn leaves and beds of fallen pine needles we ran through Winchester, over to Cross St to Woburn chatting the whole way. A dead baby snake was spotted by Lois along this stretch, and due to the lack of screaming we can only assume nobody else saw it. As we maneuvered across Main St to Lake Ave Kaj noted how quick the distance passed because of how quick a pace Brian and I set. When we pulled into the parking lot at Horn Pond the whole crew came in right behind us, each runner was putting in a strong effort today. As we choked down some Gu thickened by the cold weather we took wagers on whether we would see the Muscle Man of Horn Pond this morning. Would he be shirtless like the other times we saw him on this run? Lois set our expectations, she believed he would in fact be there but would wear a skin tight shirt revealing his over-developed pectorals. Kaj, Brian and I took the lead again as we headed around the pond. There weren’t many people out this morning, the pond was quiet, and the fall foliage shined brilliantly in the sun. Heading around the back of the pond we encountered a steep hill. Some choose to follow the wooded trail that hugs the pond to avoid the hill, as Kaj began to do. I told him we would be running up the hill this morning (love the hills, they’ll love you back) and off the three of us scurried up the hill. In coming down the hill I turned to talk to Kaj and he was gone! Granted he ran some miles prior to heading out with us so this was further into the run for him, perhaps I shouldn’t have shamed him into running up the hill. Sorry. The crew behind us opted to take the pathway, which they were very happy that they did as this was the only way you could spot the Muscle Man of Horn Pond running around the pond in the opposite direction. Brian and I never saw him. Julie and Ginny were the first to pass him, Ginny even making the first verbal contact with this Sunday Long Run legend by saying hello as he passed. For the record Lois wins the bet, she described the scene to a tee. After Horn Pond we headed back the way we came, Brian and I really pushed through this section, neither giving into the other as we raced the blowing leaves along Cross St back to Forest. Brian took the lead up the hill and I did everything I could to keep him close. Everyone else ran well through this stretch, each running strongly up the long steep incline back to the water stop. Some runners stopped there, getting in a good 10 mile run. Brian and I finished the route over to Franklin St and back Main St to Brueggers. Lois and Kaj followed in behind us with strong runs of their own. Nancy planned on stopping at 10 but felt good enough to tack on the mileage back by the Zoo and down West Wyoming. Despite the cold weather, which Sue kept keeping us from complaining about, each one of us had a run we were happy with. Smiles, stories, thoughts about where our Baystate Marathoners and Half Marathoners were at in their races, and good Red Sox talk accompanied the post-run coffee at Brueggers. As we were heading out the door Audrey and Beth finished up their 9 mile long run too, each sporting a smile. We had to adjust to the cold but it seemed to help everyone’s run, and we hope it helped keep our long run racers running strong to the finish. Let’s hear your stories! I know some of you are wondering what you’re gonna do with your Sunday morning if the Sunday Runs are over. Well, not too fast! A few of us still have races in the near future so we’ll still be meeting atÂ Brueggers at 8AM for some long runs for a few more weeks. 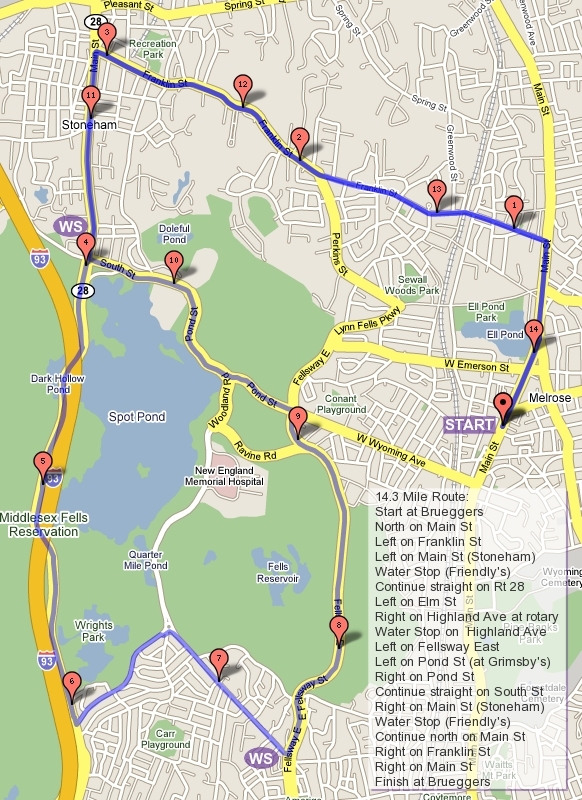 This week I’m planning on running the Horn Pond route. All I need to do is find the map…. its around here somewhere…. I’ll post a link in this message later. To do this run we’ll need a water stop near the overpass of I-93 in Winchester and another in the parking lot of the pond. The supplies are spread around, Lois and Sue each have a bin, as do I. Let’s figure out how we’ll do the stops and who’s running and go from there. One last good luck to everyone running Baystate. Catherine, Kelly, Dave, Carol, Jennifer (and her sister), Linda, Eve all trained along with us for all or some of the last few months. MRC VP Katie Sinnott will also be running. Joe Terranova, who likes to follow along with us at home,Â will be doing the half. Also doing the half is Rick Collette who has helped us out withÂ water stops a few times over the last few months.Â For those that remember them, ex-MRCers Lauren Reid and Leanne Tierney will be running the marathon as well. That’s everyone I can think of, am I forgetting anyone? Just a quick note: I’m so impressed with all the races that happened this weekend! First off Walt, 6 weeks after his marathon in France sets a personal record in the marathon. At the Mohawk Hudson River Marathon with a 3:36:29. Amazing job Walt! Then we have the BAA Half runners. Many successful first-time half marathon runners. These times are awesome for the first time trying this race distance. You should all be very proud of yourselfs. I hope the experience was positive and leads to more long distance races in your future. Which leads me to the four women that ran their first half last year at the BAA Half and returnedÂ for more. Unless they injured their back the week before the race, they each improved on their times from last year. Jen, despite the bad back, was not far behind last year’s time and would have definitely improved her personal best had she not been fighting her injury all week and all race. Completing a half under adverse conditions like she had is extremely impressive. Now on top of all of that success throw in Barry, just 2 weeks after a sub 3-hour marathon, setting his PR in the half with a blistering 1:22:22! Meanwhile while you were all doing that Lois, Mike and I were running 22 miles in preparation for Manchester in a few weeks. The next day I’m sure Mike was sitting around lazily like I was, but not Lois, she joined in as one of the 20 MRC women to run in the Tufts 10K… and set her own personal record there! Judi ran an amazing race keeping up with theÂ elite girls that show up for this race, placing 5thÂ in the masters category I hear. Another one of long runners, Beth Ford, established her new personal best in the 10K too.Â Also making the MRC proudÂ was a bunch of 2008 Walk-To-Run graduatesÂ who successfully followed their ownÂ training plan and ran great races forÂ their first 10K.